It’s #AppleWeek Day 2 and it’s all about the entrées! This recipe is all about happy coincidences. First, I was planning to have Hubs grill pork chop for dinner, but he got home super late, so I decided to cook them stovetop instead (I really need to get over my grill fear). 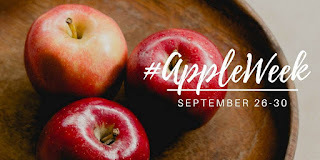 I was poking around online looking for great recipes using apples, because my boys picked tons of not quite ripe apples from my parents’ apple tree a few weeks ago and I wanted to use them up. So I made this delicious recipe. And after that I found out about a great group of ladies who are Taste of Home Volunteer Field Editors (like me!) who participate in Taste of Home Tuesdays. I’ve been wanting to cook more from the Taste of Home Magazine and Website, so this is great! 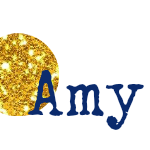 Oh, want to know where I found my pork chop recipe – boom – Taste of Home – kismet again. My whole family loved the recipe (though the kids weren’t terribly keen on the cooked apples). The sauce was great and helped keep the pork chops moist. Even though there was cream in the sauce, it felt light, largely due to the apples. This ones a keeper! Place the butter and oil in a large saucepan over medium heat. Season the pork chops with salt & pepper on both sides. Rub the sage over the pork chops, then dip in flour. Shake off excess flour and place into the pan. Add the onions and apples. Cook until the pork chops are browned on both sides. Remove the chops from the pan. Add the broth, apple juice, and rosemary and bring to a boil, scraping any browned bits off the bottom of the pan. Stir in the cream. Add the pork chops back into the pan. Cook until the pork chops are cooked through (to an internal temperature of 145 degrees F) and the gravy is thickened. Allow pork chops to stand for 5 minutes before serving. 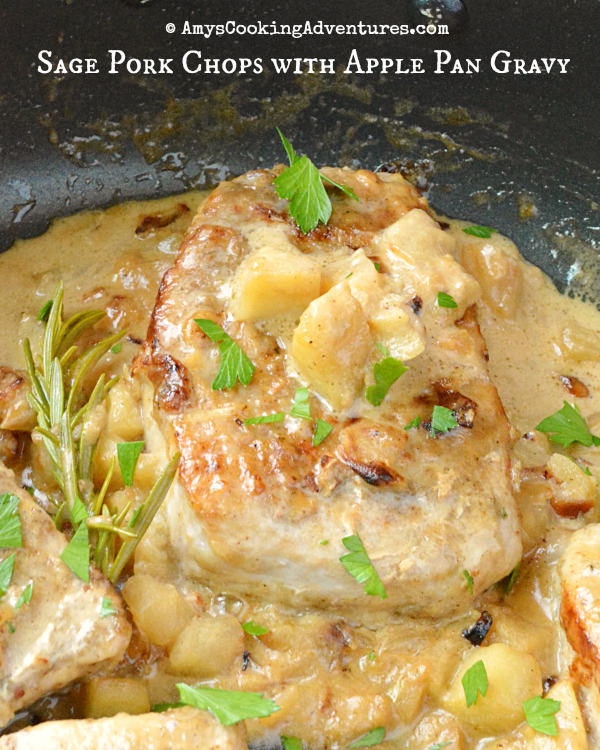 Top the pork chops with the gravy and apple mixture and sprinkle with fresh parsley. Check out more yummy main dishes from #AppleWeek bloggers! That looks absolutely delicious and it sounds like the stars aligned. You have to love it when that happens! This looks like a perfect fall supper. I love the idea of your apple pan gravy! And I'm loving checking out everything apart of Apple Week! This looks delicious. The perfect dinner for cooler weather. This looks SO up mine and my husband's alley! 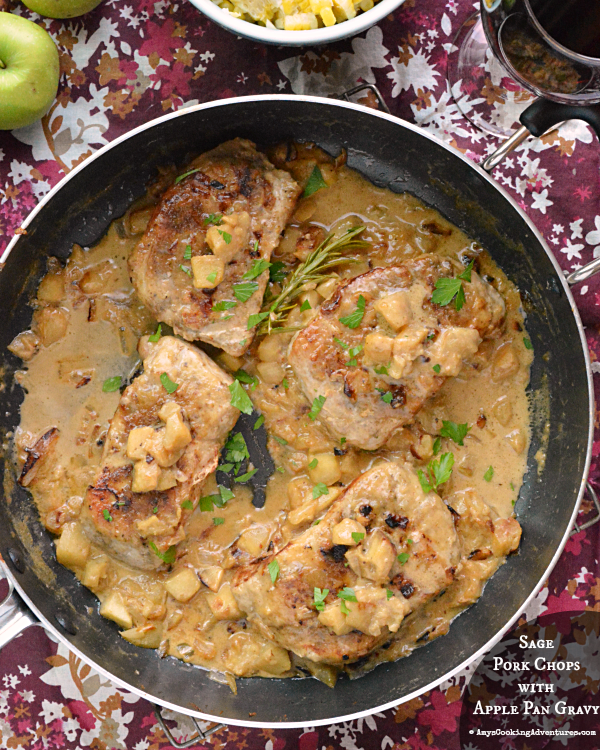 Apple and pork are a wonderful combination, it comes up in German food a lot so it reminds me of home!